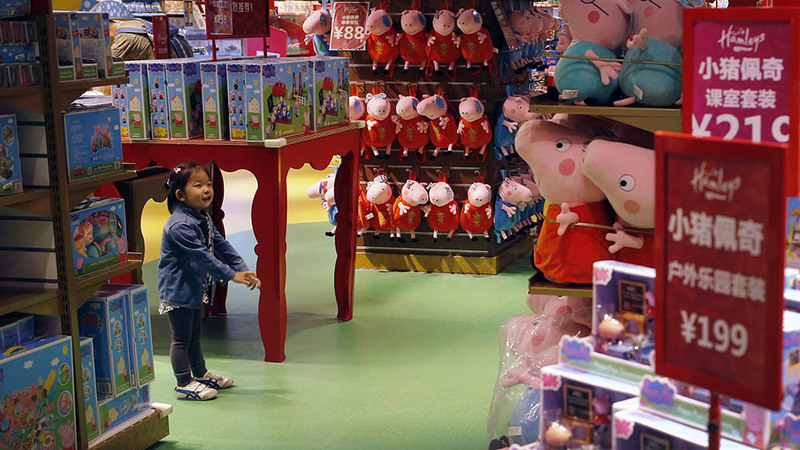 A child reacts to Peppa Pig toys on display at the British Hamley's toy store in Beijing, May 2, 2018. Chinese internet censors have begun deleting video featuring the animated pink Peppa Pig from online video sites, as the ruling Chinese Communist Party's official media denounced her as "counter-cultural" after her image was taken up in numerous memes by what the authorities see as an online counter-culture. Peppa Pig has been subject to takedowns on the Douyin video platform, while a keyword search and a hashtag of her name yielded no results. The move came as part of a drive to delete antisocial content from China's already tightly controlled internet, the Global Times newspaper, sister paper to party mouthpiece the People's Daily, reported. Peppa Pig only "broke" in China in 2015, but was quickly taken up by netizens as a perfect vehicle for memes. The Global Times described the meme-makers as "unruly slackers" who are "usually poorly educated with no stable job." "It takes a stretch of the imagination to link the seemingly innocent Peppa Pig with China's ... subculture, but after going viral, the piglet has caused considerable domestic controversies," the paper said, warning of "negative influence" to the younger generation. Parents had complained that their children had become addicted to the show, and had begun "oinking and jumping into puddles" after watching it, the paper said, citing numerous media reports. Primary and high-school students vied with each other to find the best Peppa temporary tattoos, watches and other accessories, while adults have been spotted dressing up in full Peppa costumes and posting photos to social media. But the real concern for the administration of President Xi Jinping is the widespread enjoyment of "spoofing," and other forms of satire, according to the Global Times. A homegrown pig icon, Dudu Pig, has been offered to China's social media users instead. "It is not clear yet whether this domestic pig can quell subversive enthusiasm for Peppa Pig," the Global Times reported. Meanwhile, the People's Daily appeared not to have received the memo detailing the social harm that could be caused by Peppa. Its official account on the Sina Weibo social media platform featured a video demonstration on Tuesday, showing readers how to draw the cartoon character themselves. Commentators appeared somewhat surprised, as the paper had commented in an April 26 editorial that "dodgy entrepreneurs" were making money from the use of the copyrighted image of the cartoon pig. "Has the People's Daily account been hacked?" wrote user @tiebanshangdedalongxia, while @strive-by-life wrote: "I thought Peppa Pig had been banned?" Others couldn't resist a jibe at the party's official newspaper. "So the People's Daily is counter-cultural now?" wrote user @beijingtufa, while user @manweikengli quipped: "So this is the Subversive People's Daily now, haha!" An internet user based in the southern city of Guangzhou surnamed Liang said the government is trying to police every aspect of online speech in China now. "If something displeases those in authority, they will deliberately suppress interactive sharing platforms and have it deleted," Liang said. "The social media platforms have no choice, if they want to go on existing." "There's nothing they can do about it; they just have to keep their mouths shut," he said. A Hunan-based internet user surnamed Ou said his son watches Peppa Pig most days, but that the appeal appears to be spreading. "I see the image of Peppa Pig in various situations in my daily life," Ou said. "I think it is something to do with Winnie the Pooh ... who was used by some people online to satirize Xi Jinping. Maybe the censoring of Peppa Pig has something to do with that." Winnie the Pooh was banned from China's internet last year, after netizens claimed a resemblance between the cuddly bear and Xi Jinping. An employee who answered the phone at China's powerful Cyberspace Administration in Beijing on Wednesday declined to comment. "You'll have to make further inquiries," the employee said. "I don't know." Calls to the State Administration of Radio, Film and Television were connected to a fax machine during office hours on Wednesday. Paranoid ? quite ! Poor commies, they are losing the hearts and minds now, so they became paranoid. They will lose control very very soon, since the more they censor ridiculous things the more they look stupid. The people are laughing at them.